Muhammed Abdullah, a Pomona, California Marine corps veteran and 9/11 truth activist, was raided on September 24th by a team of apparent Department of Homeland Security-coordinated agents. Abdullah described the DHS assault: "At 7 o'clock on the 24th I was in my living room when I noticed a bunch of people outside in black uniforms shuffle by. Then I heard a loud bang at the door: 'Police, open up!' I opened the door and saw all these guys in black uniforms with a battering ram. 'Are you Muhammed Abdullah?' I said yes. 'Is anyone else in the house?' 'Yes, my wife and children.' 'Come outside, please." The ten to fifteen black-uniformed individuals handcuffed Abdullah and took him outdoors without giving him a chance to get dressed (he was in his underwear). They showed him a search warrant that included allegations of welfare fraud against someone with a completely different Social Security number than Abdullah's. The black-uniformed individuals then forced Abdullah's wife to exit the house. They told Abdullah's wife that her husband was a felon with a New York armed robbery conviction. In fact, Abdullah has no criminal record and has never been to New York. The government agents began questioning Abdullah and his wife about their difficult economic situation. Since Abdullah was fired from his security job with Union Pacific due to his 9/11 activism, his wife has been working to make ends meet, but they recently fell behind on the rent. The agents asked Abdullah's wife "what do you think about his (Abdullah's) youtube video? What do the kids think about it?" The agents asked Abdullah whether he had heard of Shaykh Anwar al-Awlaki. Abdullah said that he had, since Shaykh al-Awlaki used to be an imam in San Diego until he was banned from the USA for political reasons. They asked what he thought of the Shaykh. Abdullah said that as best he could tell, Shaykh al-Awlaki "comes from Qur'an and Sunnah." The agents asked Abdullah his opinion about jihad, and about Shaykh al-Awlaki's article "44 ways of supporting jihad." Abdullah said that he thought everybody had the right to self-defense. He quoted a saying of the Prophet Muhammad, peace upon him: "Whoever amongst you sees anything objectionable, let him change it with his hand, if he is not able, then with his tongue, and if he is not even able to do so, then with his heart, and the latter is the weakest form of faith." According to Abdullah, "They (the agents) were trying to entrap and entice me. They asked things like, 'how far would you be willing to go? If you knew your wife and children would be taken care of, would you do this and this" (i.e. commit a terrorist attack). Abdullah turned the conversation to 9/11. He explained to the agents what false-flag attacks are, how they are set up to involve patsies and useful idiots, and how many terrorist attacks blamed on Muslims are not what they seem. Before the team of officers left, they took Abdullah's computers, CDs, cassettes, and bank statements. The raid, which involved between ten and fifteen officers including an apparent FBI agent and someone from the Pomona DA's office, appears to be another unconsitutional effort to infringe on Muhammed Abdullah's First Amendment rights. 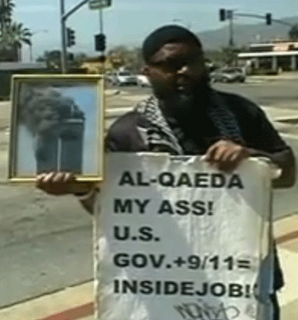 The Pomona Police Department had filed for a restraining order last spring to force Abdullah to stop distributing 9/11 truth literature on the sidewalk in front of the police station, where he was getting many thumbs-ups from cops. The judge refused to issue a restraining order after Abdullah agreed to keep a certain distance away from the Police Department. Abdullah speculates that someone in the Pomona Police Department or DA's office may be unhappy about their failure to win a restraining order, and that this might have something to do with the raid on his house. Abdullah, who was fired from his job due to his off-the-job 9/11 activism, is pursuing a case against his former employer, Union Pacific. Muslims for 9/11 Truth will continue to cover this story as it develops. Everyone is waking up to the truth. Those who get angry when they hear the truth, KNOW the truth, but want to suppress it. That is the evil part. Those who try and reveal the truth are working on the side of good.